Best Castor Oil Brands in India for Hair Growth: Top 8! We all yearn for healthy and shiny but that cannot happen overnight. It requires religious use of good and nourishing ingredients for the hair to make it lustrous and healthy. One of the best ingredients for hair growth is castor oil. It is known as the magic potion and with regular use, it enhances hair growth and texture at the same time. The oil is suitable for moisturizing the hair, promoting growth and preventing hair loss. It has a very thick consistency and hence is used as a carrier oil, ie diluted with other oils. It is mostly used with other hair oils like almond, amla or olive oil and in hair masks. There are several brands available in the Indian market which claim to contain castor oil however they mostly consist of mineral oil which isn’t great for the hair. Hence, you should always opt for either cold pressed or pure form of castor oil to get the best results. 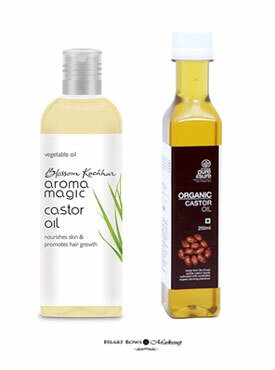 Today, we handpick the best castor oil brands in India for hair growth with reviews and prices. The Soulflower Coldpressed oil is one of the most popular and affordable castor oils in the Indian market. The product has a very thick consistency and is slightly sticky, which is the true nature of castor oil. It has no added fragrance and is best suited for the skin and hair. Since the oil is naturally rich in anti-oxidants, it works as a deep conditioner. This carrier oil is a hair growth stimulator and controls hair loss. It is packaged in a light weight plastic bottle with a white flip open cap making it travel friendly and spill proof. This is definitely one of the best and purest castor oils available in India. Aloe Veda is a luxury wellness and beauty brand from South India and is inspired by Ayurveda and Aloe Vera. Their products are great for aromatherapy and are 100% natural since there is no inclusion of mineral oils. 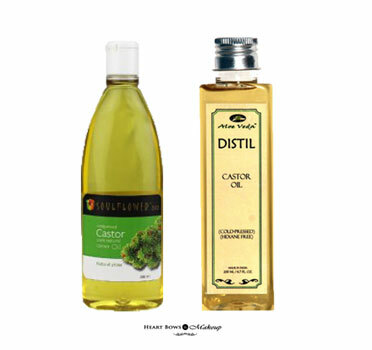 Their distil castor oil has many medicinal and curative uses and is suitable for both the skin and hair. The anti-bacterial and anti-fungicidal properties of ricinoleic acid protects the scalp and hair from infections that can cause hair loss. It comes in a transparent bottle with a screw on cap and is easily available online. Aroma Magic’s Castor Oil can be used on the skin and hair. It helps in treating wrinkles and fine lines. The oil also aids in reducing split ends and controls hair breakage while conditioning and moisturizing the hair. Its low molecular structure allows for deep penetration and is great for aroma therapy as well. The castor oil is packed inside a cylindrical plastic bottle and has a thick consistency. It is available easily in stores and online on various shopping websites. This is another affordable castor oil brand for hair growth. It guarantees 100% certified organic castor oil, made from the finest quality castor seeds sourced from certified organic farms across India. It is a cold pressed castor oil and is perfectly safe to be used for the hair and skin. The product comes in a slender rectangular bottle with a white screw on cap. There is a dispenser to take out the product and is easy to carry around. A highly recommended organic castor oil in India. This Castor & Rosemary Hair Growth Oil by Soulflower is the perfect combination for hair growth. It helps to nourish the tresses and is the ultimate potent hair elixir. The hair oil consists of a combination of cold pressed Castor and Rosemary oils. It is purely vegan, handmade, organic and helps the hair grow faster, controls hair loss and makes it shinier. The oil is also beneficial at preventing split ends and does not leave any greasy marks on the pillow. It has a lighter consistency than pure castor oil and comes in a sleek plastic see through bottle. 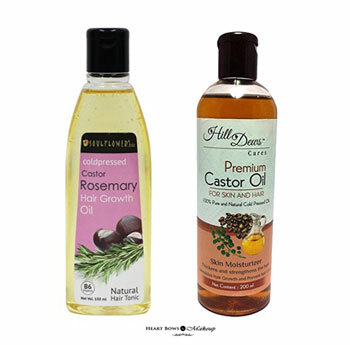 HillDews Castor Oil is a 100% pure, unrefined and unbleached castor oil which can be used for the hair and skin. The product has been extracted using the traditional method hence the consistency of the oil is thick. It has a slightly strong scent but won’t bother you too much. The bottle is transparent and made of plastic and thus extremely easy to carry around. One of the best castor oil brands in India for hair regrowth. Compared to other brands, the Deve Herbes Castor Oil is slightly pricier. The oil has a very thick consistency and has a slight medicinal smell. It is 100% natural and is certified pure. The oil is extracted from castor seeds and used in conditions like birth control, hair care, and skin care. It is dermatologically certified as well. 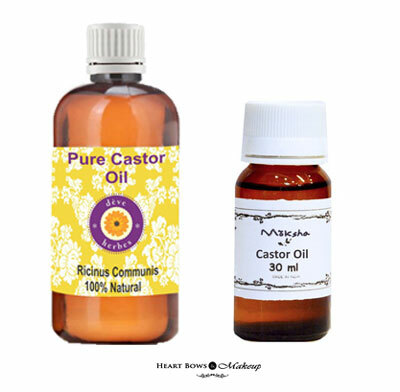 The Moksha Castor Oil is used for hair, skin and aromatherapy. It comes in a dark amber colored cylindrical bottle and is spill proof. This castor oil helps to get rid of dullness and rough hair and can be widely used with other essential oils as well. The product is 100% pure, affordable and easily available online. All these castor oils in India can be easily bought online on Amazon & Nykaa. Castor oil has various natural antibacterial and anti fungal properties. It is high in Vitamin E, minerals, proteins and Omega 6 and 9 beneficial fatty acids. Its unusually high ricinoleic acid ratio makes it beneficial for both the skin and hair. Castor oil is even used in pharmaceutical medicines, perfumes, polishes, waxes, etc. The high lubricating properties of the oil helps the hair to lock in the moisture. We often witness hair loss and hair thinning due to various reasons like hormonal changes, pollution, inadequate diet, insufficient care, etc. but if you use castor oil on a regular basis, you can surely benefit a lot from it. Ricinoleic acid present in the oil is also said to help balance the scalp’s pH which helps to replenish the natural oils and undo some of the damage caused by harsh chemical hair products. The presence of antioxidants in castor oil helps build the the keratin in the hair and make it stronger, smoother and less frizzy. This amazing hair oil also helps in fighting scalp infections, dandruff, reduces split ends and serves as a natural conditioner and moisturizer. How to use castor oil for hair. 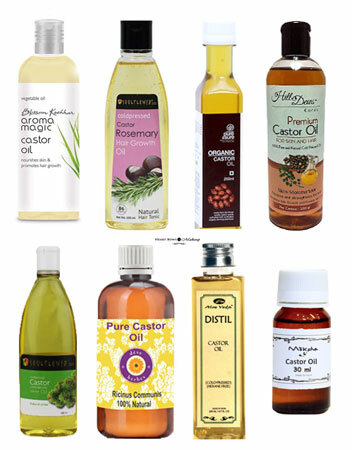 Castor oil has a thick consistency and is best suitable for mixing with other lighter oils like coconut, almond, etc. It makes a very good concoction for hair growth and is easy to apply on the hair. For application, lightly warm the oil and apply it directly onto the scalp and massage in circular motion. Castor oil can also be used in hair masks and hair packs for dry hair.